The original graphics and text omitted the Brewers, Cardinals, and Yankees. They have since been corrected. If you’re on Twitter, you’ve probably noticed the current hashtag contest, #FaceofMLB, being run by MLB Network or the RBI Baseball advertising campaign. Social media has become an important platform that Major League Baseball teams use to communicate with their fans, especially during the off-season when there aren’t baseball games to watch or attend. Twitter has also been touted for allowing teams or players to interact directly with fans, removing the need for an intermediary. 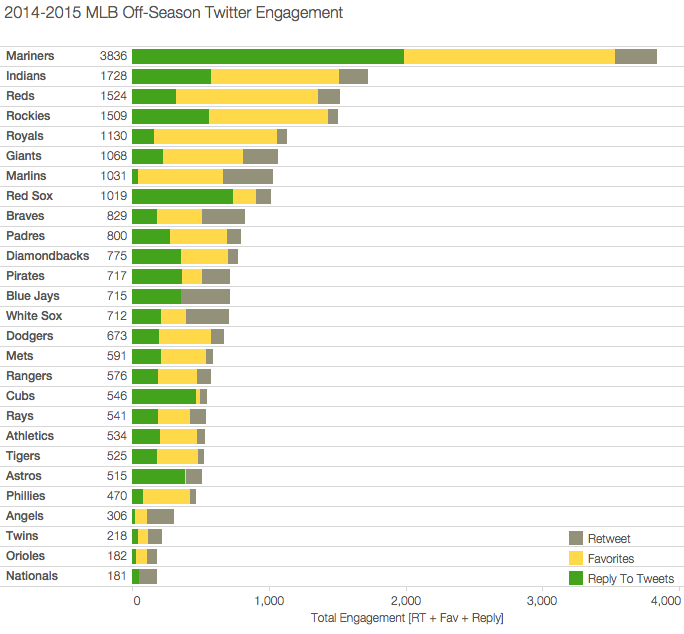 To measure that interaction, I gathered the timelines and favorited tweets from all 30 MLB clubs’ official Twitter accounts from November 1, 2014 until February 10, 2015 and ran an engagement analysis. 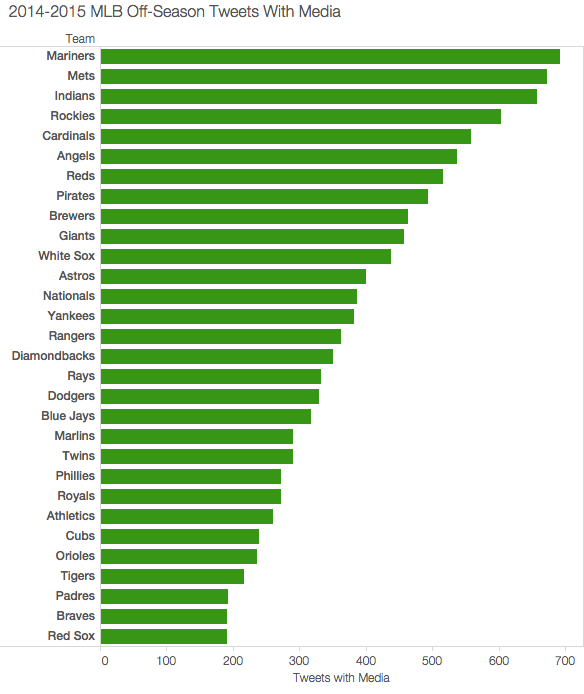 This particular analysis looks at how much effort each MLB team makes to interact with its fans, and not simply which team has the most followers. I’m looking at engagement three different ways: volume of tweets, media sharing and fan interaction. First, let’s look at volume of tweets. While I feel that tweet volume is one of the most basic metrics, it’s the best place to start, since teams that are generating more content reach fans more often. I plotted the daily Twitter activity of each MLB team starting in November 2014 through February 2015 with each dot representing a day and the color representing tweets per day. 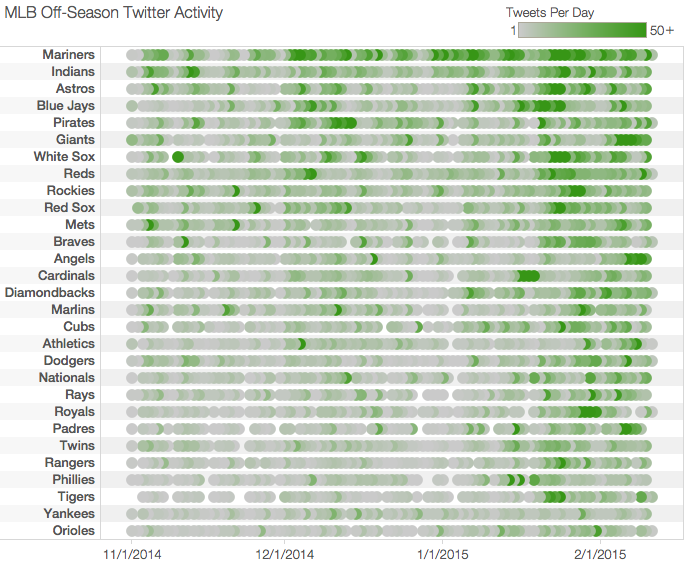 Looking at the plot, most teams had a lull in tweet volume in November and December, but have increased tweets ahead of pitchers and catchers reporting to spring training. 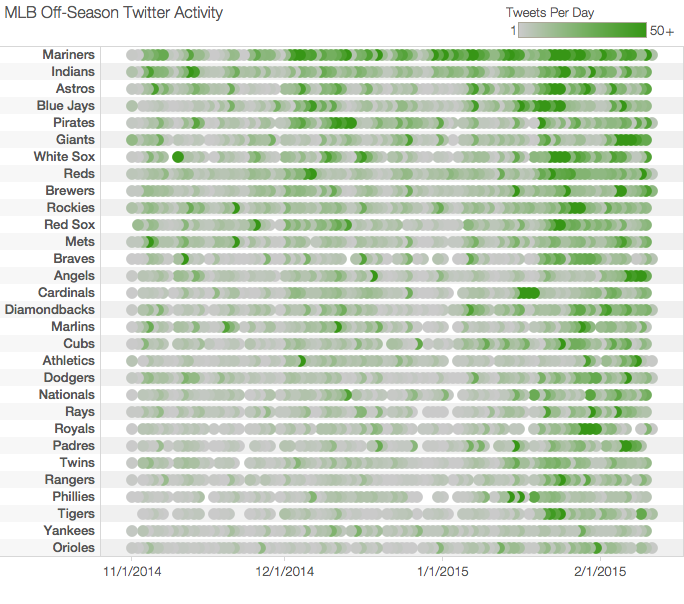 The Mariners had the most activity, consistently tweeting more each day than other clubs. The Indians, Astros, Blue Jays, and Pirates followed close behind, while the Giants looked to have ramped up their social media department within the last two weeks. The Orioles, Yankees, Tigers, and Phillies round out the bottom of the list, with the Tigers’ social media department noticeably taking weekends off in November, which can be seen in the consistent two to three day gaps in Twitter activity on weekend dates. Sharing media in a tweet is an effective way to enhance connections with fans, or promote revenue through advertisements. There has been a barrage of “truck-day” tweets from almost every MLB team showing photos of equipment trucks loading up gear for spring training. A team can leverage sharing these images to 1.) get fans excited for spring training and the upcoming season and 2.) create a connection between the fans and the team by showing them a side of baseball operations fans don’t normally see. Once again the Mariners lead in this category with the Mets surprisingly close behind. Looking at their media timeline, the Mets seem to have a lot of traditional baseball promotion material: players, fan fest, and charity work, while the Mariners have some rather interesting photos on their timeline. It’s worth checking out. So far the analysis has looked at how MLB teams have pushed content out to their followers, but I’m interesting in quantifying how often the teams respond to tweets, retweet fans, and favorite fans’ tweets. To calculate the engagement metric, I simply added the number of replies, retweeted (non-verified), and favorite (non-verified). Ideally, I would like to apply weights to them, since favoriting a tweet requires less effort than replying to a tweet, but I couldn’t find a method that wasn’t entirely arbitrary. These three actions are personal, since they represent feedback from the organization to an individual fan. Not surprisingly the Mariners once again lead this criteria, but the Brewers are close behind favoriting a lot of tweets. The Blue Jays, Nationals, Cardinals, and Yankees curiously have favorited very few tweets both during the off-season and on their accounts overall. In fact, the Nationals only have two favorites, and both are from the last two months. This leads me to believe they might have cleared their favorites during the off-season. Overall, the Orioles and the Yankees are at the bottom of both the volume and interactions metrics, so if Twitter fan engagement was a contest, they would both finish last. 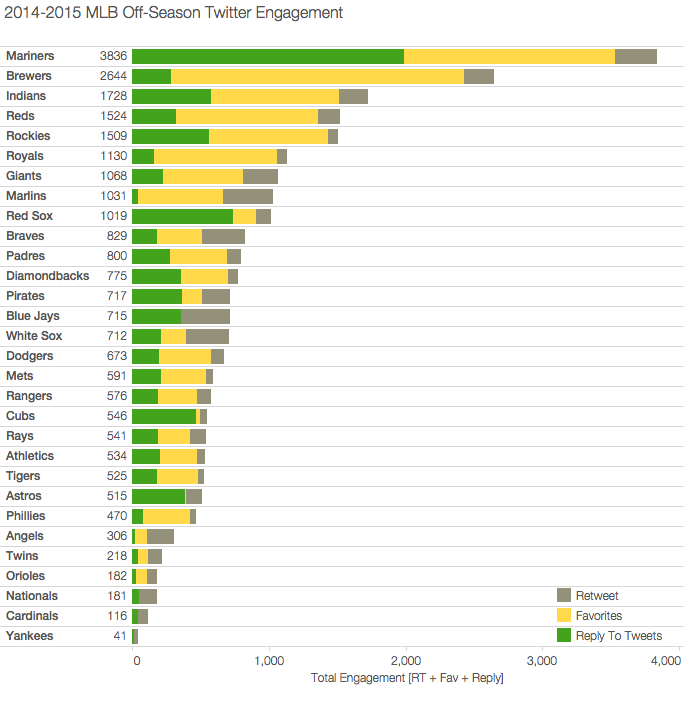 To answer the question of what team utilized Twitter the most during the off-season, the Mariners have shown a stronger and more interactive social media presence than any other MLB team in every category. I’m curious to see what Seattle fans think of their team’s social media presence. Notes: I collected all this data over the past week using the Twitter API, which only allows collection of the last ~3,500 tweets from a user’s current timeline and their favorite list from the time it’s accessed. This data represents the most recent items on their timelines at the time it was collected. All the retweet and favorite list data counted only non-verified accounts; this was intended to better represent average fans. 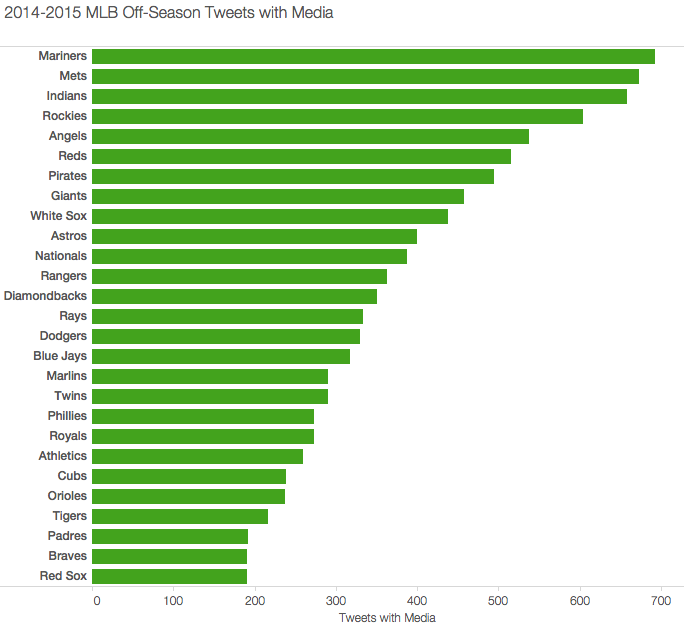 We hoped you liked reading Off-Season Twitter Usage Among MLB Teams by Sean Dolinar! The Yankees seem to be absent from the latter two graphs. I’m currently fixing that and the other omissions. I had some programming issues. Thanks everyone for pointing that out.